They preformed at a level that was effortless. That is what everyone (especially athletes) aspire to achieve greatness in a effortless cool way. No one wants to grind it out anymore, show effort. I loved the grind of preparing for anything of a physical nature, I would try to make my training, practice, and overall preparation harder than the contests that I performed in. This gave me sense of confidence that I could handle any situation during the game and impose my will on whoever I was competing against. You are well on your way to hitting the 30 lb weight loss goal you set for yourself on January 1st 2019. You are 1 month and 15 days into your training and nutrition regimen, and you are 10 lbs down (that breaks down to about 1 lb -1.5 lb per week). Here are the Atlas Pro Training’s top 3 options to help you lose that last 20 lb over the next 12 weeks so you can be ready for the summer by early May 2019! This is a basic form of calorie restriction. Although there are several different versions of intermittent fasting, they all have the same fundamental rule; No Food or drink with a caloric value are to be consumed during the fast. One of the most popular versions is the 16/8 method where you fast for the first 16 hours of the day, then you eat during the last 8 hours of the day consuming 1-2 meals. This is tried and true way to increasing your energy expenditure to 525-625cal of energy per day. This could possibly help you hit that 1 lb- 1.5 lb fat loss per week. However, the 1# rule to remember is that you can not train yourself out of a bad or inconsistent nutrition/diet routine. The key in any exercise plan is have some variety and different variations of physical activity that match your goals and your personality. For example, some people like to lift weights and hate cardio (that’s me :-)) and vice versa. For example, you could increase your workload, ie., distance of running, increasing the weight that you lift, increasing the amount of reps, etc. You can also add or increase a different type of physical activity to your training program, ie., add more running/ walking/ sprinting to your training program, reduce your rest times between sets to less than 30 sec. (This adds a “cardio” element to your weight lifting session , which can help you increase your energy expenditure leading to more fat loss). You can incorporate a weightlifting circuit in your daily training program. Doing so will improve strength level and allows you to gain more lean muscle. This action will increase your metabolic rate and your increased energy expenditure will lead to fat loss. This is a more holistic way of planning out your weightloss program, and in my opinion, this should be the first method you should try to lose unwanted fat. Tracking and counting your macronutrients (i.e. Fats(9 calories per gram), Protein(4 calories per gram), Carbohydrates(4 calories per gram), can take the guesswork out of planning your meals in regards to calculating an accurate caloric balance that fits your lifestyle and or training program. There are several techniques that can be used to train your lungs and diaphragm to work more effectively, by increasing the lungs capacity which will help increase the amount of oxygen that is drawn into the lungs and strengthen the diaphragm. As an athlete, I would do a self-audit once a year always trying to see what I could do to improve my performance from year to year. I realized that my breathing was the one thing that was an issue and seemed to not improve as I played until later in the season and my endurance was below average. So I thought about what sport was dependent on developing endurance, so I started researching distance runners and I found that there was breathing exercise that some of the top runners would do to improve their lung capacity. The concept was developed from a boot camp and a small group training sessions that I ran at the second gym I worked at when I first started. Most boot camps use just body weight for resistance and are really heavy cardio training (at least from the ones that I have attended and or seen) I wanted to include resistance training exercises within the session along with heavy to medium cardio, and core training. One of the main areas that I wanted to focus on was limiting injury but maintaining a medium-high heart rate and allowing the individual to focus on the movement first and not have to focus on counting reps. Here is an example of a training session………. Regardless of what method you chose to use for your body composition measurement, it is best to use one testing and analysis method to insure accurate and consistent results to limit conflict and false information. Take a few minutes to research and find the best method for you and measure your progress beyond the scale. No matter what your health and fitness goals body composition testing and analysis will be a game changer for you and give you the information you need to truly transform your body. Everyone (including myself) looks for an edge in the continuing battle to lose body fat. The key is to use those energy stores in the most effective way possible, specifically to maintain an balance that allows you lose body fat maintain or gain lean muscle in a healthy fashion. As I sated in the introduction blog post “ESD training should be the foundation of any training plan” which leads me into the question which form of ESD (Energy System Development) training is the most efficient when its applied to a weight loss plan? Some would say that long durations of slow steady state cardiovascular training such as jogging, or walking would be the best way to lose body fat, and technically that would be correct but these forms of training to lose weight will get you just so far on your journey to drop that last 20 lb. or dropping your first 5 lb. · ATP-CP Phosphagen energy System- used during short term, high intensity activities Ex. Throwing a Shot Put, Sprinting, Olympic lifts of 2-4 reps: Last 1-30 sec. Uses glycogen already stored and available in the muscles. · Anaerobic Glycolytic energy System - used during medium/high intensity activities, Ex. Strength/endurance: lasts 30sec-3mins. Uses stored glycogen form other tissues in the body such as the liver. · Aerobic energy System- used during long durations of exercise lasting longer than 30 min to 1 hour. Uses oxygen to convert stored body fat into to ATP for energy. The byproduct of this process lactic acid which is also used as an energy source. As you look at the definitions of each of these energy systems you might think that the best way to burn that unwanted fat is through the aerobic energy system, but you might be wrong. Lets face it Aerobic exercise is an affordable and easily accessible form of exercise in where this energy system actually uses stored body fat to convert it into usable energy (after about 30-40 minutes of exercise). But you must remember the aerobic system is not as efficient in actually conditioning the body to burn more stored fat, the only way to effectively burn fat for energy is to have enough lean muscle mass to increase your resting metabolic rate which should be the goal of any weight loss or body composition improvement program. This brings us to what most consider to be the sweet spot of energy system training which is the Anaerobic Glycolytic energy System. This form of energy systems training as compared to the aerobic energy system, which used primarily to improve the efficiency of the cardiovascular system in most training programs, it does not help build and maintain lean muscle mass like the Anaerobic Glycolytic energy System does. This is a major flaw in weight loss training programs that primarily use cardiovascular training to improve weight loss or body composition. In fact in most cases aerobic activity maybe limiting the bodies ability to use stored fat as energy especially if the individual's nutrition is not balanced and up to par. As I mentioned before the only way to effectively burn stored body fat is by increasing lean muscle which in turn improves the individual's resting metabolic rate. · Aerobic energy System- used during long durations of exercise lasting longer than 30 min to 1 hour. So let’s look at the ATP-CP Phosphagen energy System which is used to produce energy for high intensity, quick powerful bursts of movement. This energy system does not require oxygen to produce ADP from ATP. Creatine phosphate (which is stored in the skeletal muscles) is used to produce form ADP from ATP. This process is instant and the energy created is used and depleted almost just as fast, causing the athlete to fatigue faster. The goal when training this energy system is to use short bouts of exercise at a minimum volume (number of repetitions) to insure full recovery. As the athlete progresses through the training program the training load is increased not the volume (number of repetitions). This form of training (called Plyometric and or ballistic training) is used to increase the explosiveness of athlete, which increases the force that is produced during movement. Example of these forms of training are Box jumps, Medicine ball throws, and in Olympic lifting. This stress is beneficial to an athlete’s performance because by increasing the force that is produced during movement the athlete can run faster (by producing more force against the ground i.e. Box Jumps), which is referred to as improving the ground force reaction of the foot against the surface, which is essential to improving athletic performance. This energy system should be stressed in a conservative manor because the recovery time is longer than the duration of the energy systems use, and should be performed on a firm yet energy absorbent surface like rubber flooring. The quality of the explosive movement is more important than quantity of repetitions of the movement. The second energy system we are going to look at is the Anaerobic Glycolytic energy System, which uses glycogen stores from the muscle and blood glucose to produce energy. 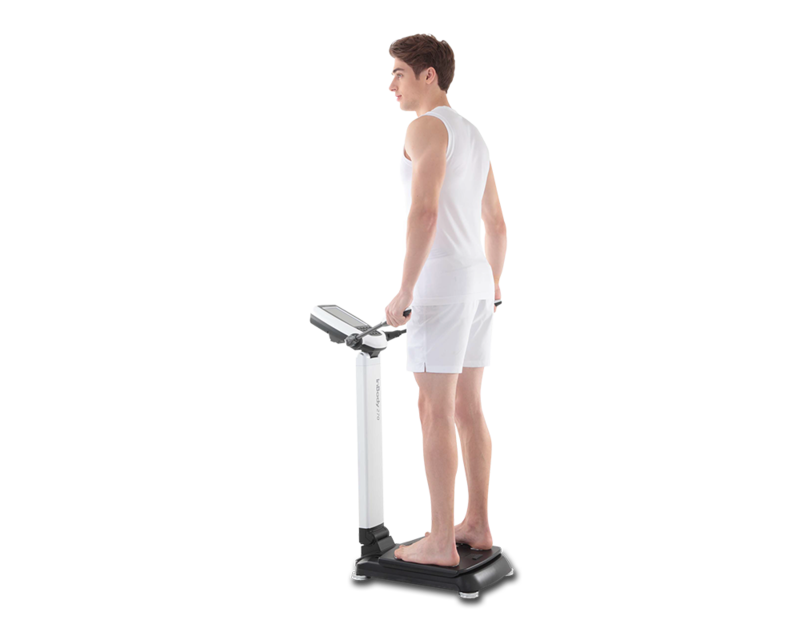 This is considered by many trainers (including myself) as the predominate energy system, which is used to produce energy to sustain movements that last 30 sec to 3 minutes. It does not require oxygen but produces lactate acid which causes muscles to fatigue and shut down. The goal when training this energy system is to improve the lactate threshold (which is the time that it take for the muscle to experience limitations due to the accumulation of lactic acid) the athlete. This is an important aspect of improving the muscular endurance of the athlete, which is the goal to decrease the chance of injury and increase their work capacity during competition. Strength training with a focus on limiting the recovery times 30sec to 1min between sets and exercises; also tempo runs (running at 70-80% effort for short distances less than a mile for repetition). The third energy system we are going to look at is the Aerobic energy system, which uses oxygen to produce APD from body stored fat and skeletal muscle, making it the most complex of the three and the most labor intensive energy system. The Aerobic energy system is used during activities that last for relatively long durations, like 30 min to 1-2+hours. The goal of training this energy system is to improve the cardiovascular efficiency of the athlete. This form of training improves the work capacity of the athlete allowing them to train for longer periods reducing debilitating cardiovascular fatigue. This could be considered the foundation of improving the performance of the athlete. Steady state cardiovascular training such as distance runs between 1-3 miles (depending on the sport the athlete is training) can be used to train this energy system, and some forms of HIIT (High Intensity Interval Training) with recovery times that are limited to less than 1 minute between exercises. The goal of any training program should be to develop these energy systems and “train” them to produce the energy in an efficient manor during practice and competition so that energy is readily available to the muscles during physical activity. 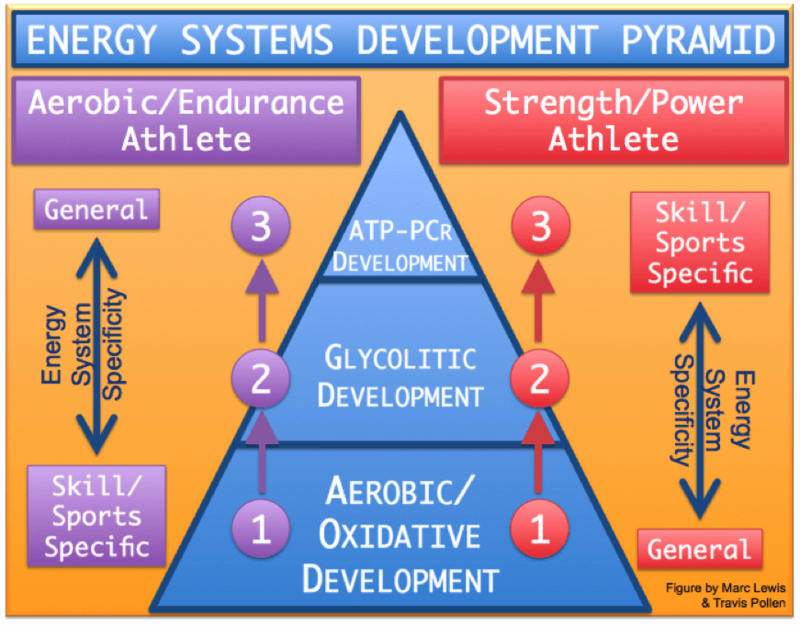 All of three energy systems are interdependent of each other, but in most sports one energy system or a combination of two of the three are required to make things happen. This goes into the concept of sport specific training and how to create training programs that are designed specifically to produce the improvements in muscular endurance, cardiovascular fitness, and improvements in speed and power of the athlete. As your youth athlete enters the offseason training program’s make sure that EDS training is the foundation of their training program. Your Comments are welcomed below!